Among the tragic outcome of the Blue Star attack, was the reaction and revolt of Sikh troops. Although there was a media blackout in Punjab, rumours of the assault on the Darbar Sahib managed to leak out and over 5000 Sikh soldiers spontaneously deserted their regiments in a bid to get to Amritsar. These soldiers are affectionately called Dharmi Faujis, which loosely translated means Soldiers of Faith. Every Sikh soldier swears an oath that he would not let any harm come to Sri Guru Granth Sahib first, before swearing an oath that he would not let any harm come to India. Had there not been a media blackout and false government propaganda, the scale of rebellion would have been even larger. The Government initially did not publicly admit the revolt, and even later referred to the troops as having deserted rather mutinying (abandoning ones post as opposed to a mutiny or rebellion). It is interesting to note that prior to the attack the Sikh Regimental Centre was purposefully shifted outside of Punjab to Uttar Pradesh (by comparison, the Bihar Regimental Centre is located in Bihar and the Rajputana Rifles are based near home at Delhi). This clearly shows the intentions of the Government and their view of Sikhs. Military analysts have commented that although the Sikhs that defended the Golden Temple complex kept the army at bay for over a week, had the Sikh Regiment been stationed in Punjab, the outcome of the battle could have been very different. The Indian Government was well prepared and the Army had already been deployed to check the advances of the rebel Sikh troops who were travelling thousands of miles from 9 different States towards their ancestral homeland. Although desperately outnumbered, the Sikh soldiers faced the Indian Army and fought gun battles in Uttar Pradesh, Maharashtra and Gujarat in which hundreds of Sikhs were killed by the military. After leaving prison many had to work as manual labourers to support their families, whereas if they had still been in the army they would have enjoyed high ranking positions and state pensions. Nonetheless, they are proud men and do not regret their decisions. The courage and dedication shown by the rebel Sikh troops is awe inspiring, facing impossible odds, they did not hesitate to stake everything in an attempt to protect their faith and nation. 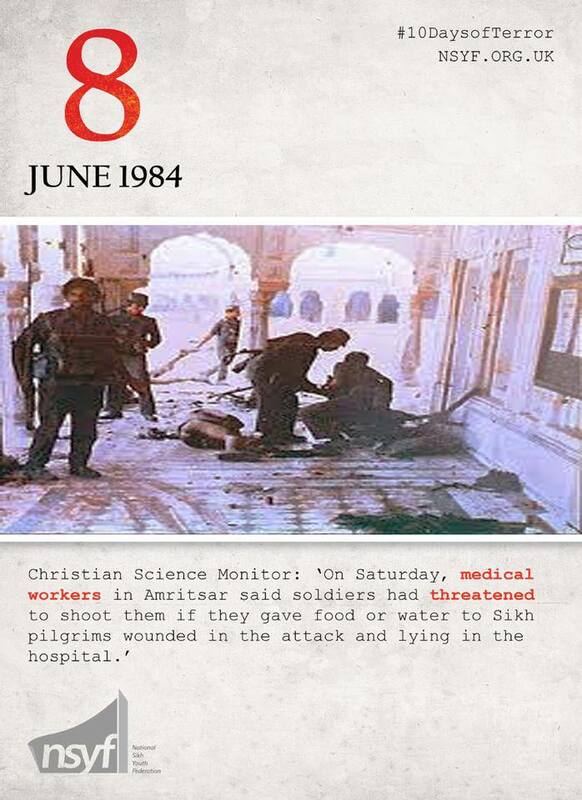 It is on record that in stark contrast to their Government, who was indiscriminately massacring Sikhs, the Sikh soldiers engaged only with the army, and no civilians were reported to have been harmed. 1. Associated Press, as reported in The Palm Beach Post – Jun 18, 1984; 5000 troops deserted in over 9 states. 2. The Ottawa Citizen (Jun 12, 1984) reported that even in the North Eastern State of Assam 345 Sikhs were arrested for marching towards Amritsar to “liberate their holiest shrine”.